Fellingham, A.C. and Meyer, N.L. 1995. 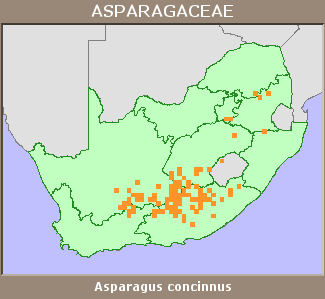 New combinations and a complete list of Asparagus species in southern Africa (Aparagaceae). Bothalia 25(2):205-209. Obermeyer, A.A. 1992. Smilax. In: O.A. Leistner (ed). Flora of southern Africa 5 Part 3 Dracenaceae, Asparagaceae, Luzuriagaceae and Smilacaceae:85-86. National Botanical Institute, Pretoria.